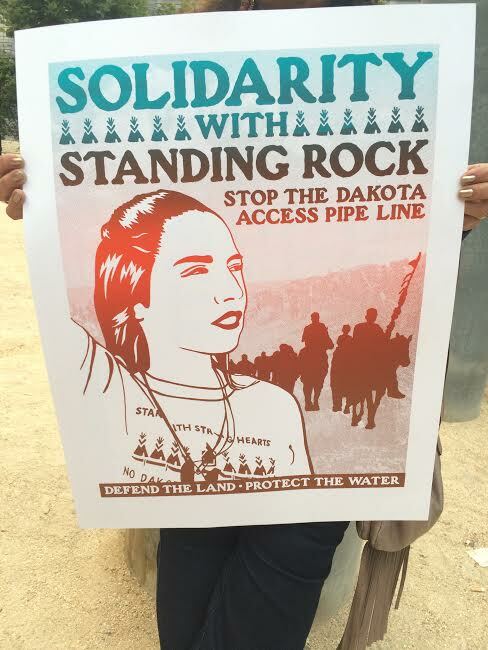 As the people of Standing Rock Reservation continue to take a stand against the “Dakota Access Pipeline” (DAPL), many of their allies and relatives are gathering to protest in North Dakota and across the U.S. The SF rally was also attended and addressed by Native Californians. Speakers recognized and paid respect to the Ohlone and Miwok Tribes, whose ancestral lands include the San Francisco Bay Area. In the past few weeks alone, the Tlingit and Haida tribes of Alaska have sent delegates to Standing Rock, along with representation by Native Hawaiians, the Hoopa Valley Tribe of California, the Comanche Nation of the Great Plains, and the Crow Nation of Montana to name a few. As of the 23rd of August, more than 80 resolutions and letters had been written and submitted by tribal governments in solidarity with Standing Rock. Many non-Native allied groups have also shown up in support of the DAPL protests: just last week, Black Lives Matter Toronto arrived as delegates to support the resistance at Standing Rock. Dozens of water protectors (the chosen terminology by those protesting against the pipeline) have been arrested thus far and the numbers continue to increase. On the 23rd of August, the day before the San Francisco rally, Homeland Security removed the water supply to the DAPL protest site under the claim that the water tanks were not secure in the area due to “unlawful activity”. The large tanks that were removed from Sacred Spirit Stone camp constituted the camp’s main drinking water supply; two air-conditioned trailers and a command center vehicle were also removed from the site, due to stated security reasons by Homeland Security Division Director, Greg Wilz. Amid rising tensions, Amnesty International USA has sent a delegation of human rights observers to monitor the events on the ground between law enforcement and indigenous communities in protest. 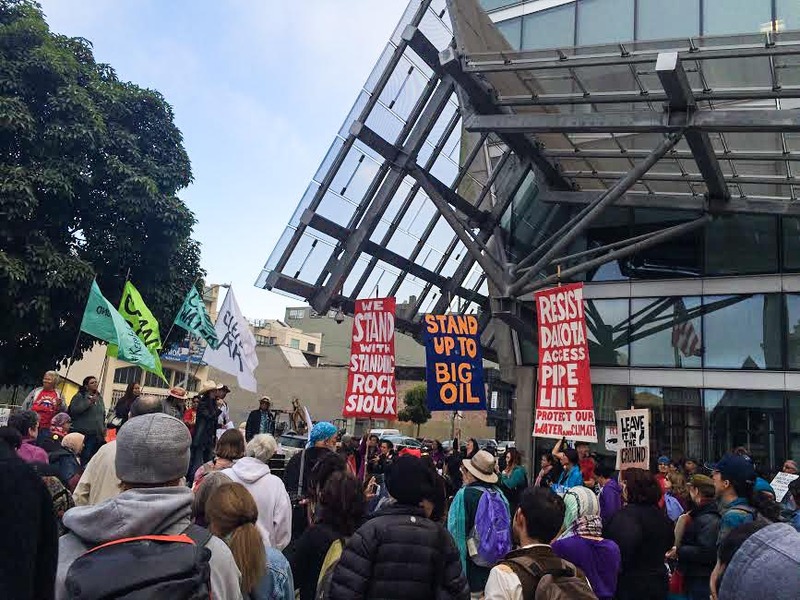 At the rally in San Francisco, Native community activist Wahleah Johns, gave testimony about her personal struggle with fossil fuel extraction in Black Mesa, AZ on the land of the Navajo Nation. She told stories of pipeline breakage, water source contamination, and environmental despair over the past 50 years in Black Mesa. “The rights of indigenous peoples and of nature are going unrecognized,” she said. “I’m standing with Standing Rock because I don’t want this to happen in their back yard.” She also called for fundraising and material support to those on the front lines. The organizers of the Solidarity SF rally a few days ago released positive news that $1457 had been successfully raised and conveyed to Protectors & Defenders on the frontlines, to rooms for elders, for supplies, and for the legal fees of the arrested. Although the Standing Rock Sioux Tribe sued the US Army Corps of Engineers (USACE) over the DAPL pipeline approval in July, the construction has only now come to a halt, due to the protests and actions in response to the pipeline proposal. Oceti Sakowin Youth from Standing Rock and their allies set out on a 2,000 mile run from the Reservation to Washington D.C. to deliver their petition to lawmakers and a letter to the White House and USACE, asking representatives to stop construction of the DAPL Pipeline in the Bakken region due to risk of polluting ancestral lands, sacred sights, and the Reservation’s main water source from Cannonball River, a tributary of the Missouri River. The run was recently completed and the materials were delivered, but the actions of protest have not stopped there. On the 29th of August, protesters stationed themselves outside of the offices of the legal council for Energy Transfer Partners in Bismarck, ND and more tribes are arriving in caravans to stand with Standing Rock every day. The proposed $3.8 billion dollar pipeline would run upstream from the Reservation, carrying 570,000 barrels of crude oil per day across four states and the Missouri River itself, equalling 1,172 miles. Native activist, Winona LaDuke, estimated that such a mass transport of crude oil would result in around 250,000 per-day tons of carbon into the atmosphere. Until today, there has been no tribal consultation on the pipeline plan. Although the pipeline construction has been successfully halted for at least three weeks, the project is still on the table and this temporary state is worrying for the people of Standing Rock and their supporters. The recent completion of the run from the Reservation to Capitol Hill hopes to reinforce the importance of halting construction to lawmakers. In interviews, many of the Dakota/Lakota/Nakota youth organizers have reflected on the intertribal Native-American prophecy that the seventh generation will restore the balance of the World, as we know it. This generation is now the seventh since the prophecy and their convictions are ever firm that the time for action is now. A Federal Judge will rule on the Dakota Access injunction, as filed by the Standing Rock Sioux Tribe, on September 9th. Nadya Tannous is a community activist and writer located in the Bay Area. She is the co-founder of Weird Sister TV and Tour Coordinator with Friends of Sabeel –North America for the upcoming tour of No Child Behind Bars: Living Resistance from the US to Palestine.